warriors group. . HD Wallpaper and background images in the Warriors (Novel Series) club tagged: others. This Warriors (Novel Series) fan art might contain anime, komik, manga, and kartun. Who are in the picture?? omg thosse r the cats who went on the journey! Squirlflight Brambleclaw stormfur feathertail Crowfeather n Tawnypelt! O.K I cam get this: the one in the upper right is Spottedleaf and the one below her is Bluestar. The 2 in the middle are Brambleclaw and Squirrelflight. Then the last 2 are Graystripe and Millie. PS. i guess Bluestar and Spottedleaf are visiting from Starclan. @ Bluestar415 : I agree with you! 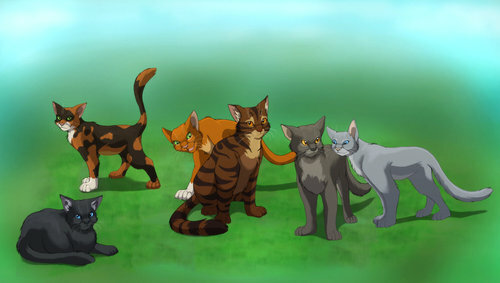 awww so cute the jorneyin cats but why is Crowfeather by himself?? LOL!I thought crowfeather was ashfur! Ashfur has spots that are about Crowfeather's pelt shade, but Ashfur's main pelt colour is pale gray. Crowfeather looks like a grumpy elder in that pic. He's grumpy and aggressive(he got that from his old mentor, Mudclaw), but he's not an elder yet. And he's better than he was when he was an apprentice Crowpaw now that he's become a full WindClan warrior Crowfeather. Unless you were thinking of the ShadowClan elder Ashfur.